Abstract: Introduction: Packaging comes in many colors and finishes, from matte to glossy. Adapting the design to each local taste can be challenging. The purpose of the research was to understand why some people are more attracted to shiny packagings and formulate recommendations on how to select the right packaging finish for the relevant personas. Methods: The link between consumers’ visual perception and their packaging preferences was investigated. A combination of sensory, biometric, and neuro-ophthalmological tools were used, including the Derval Color Test®, to measure the perception of color nuances, and Imagine Eyes in-vivo retinal camera rxt1 to capture the retinal mosaic. The experimental group comprised of 200 men and women with various taste preferences in fashion accessories and packaging, who accepted to share their preferences for glossy and matte surfaces and their answers were classified by type of light (unpolarized, linearly polarized, circularly polarized). The shoppers were classified based on their polarotactic behavior (super-polarotactic, medium-polarotactic, non-polarotactic). Results: A link between consumers’ type, number, distribution, direction, and reflectance of photoreceptors and their packaging preferences was established. Super-polarotactic subjects presented less reflective spots on the retinal mosaic. 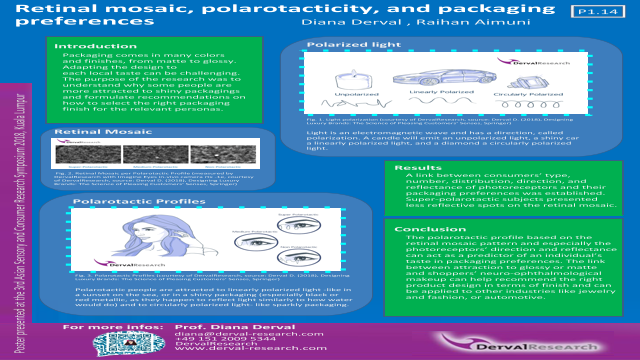 Discussion: The polarotactic profile based on the retinal mosaic pattern and especially the photoreceptors’ direction and reflectance can act as a predictor of an individual’s taste in packaging preferences. The link between attraction to glossy or matte and shoppers’ neuro-ophthalmological makeup can help recommend the right product design in terms of finish and can be applied to other industries like jewelry and fashion, or automotive.